Syracuse University’s Sustainability Division is making it easier for everyone on campus to recycle more of the most common recyclable items such as paper, plastics and glass. With the help of a team of student volunteers, new recycling signs have recently started going up across campus. 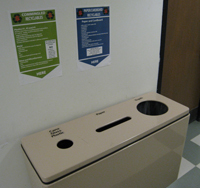 The posters are being posted directly above or on recycling receptacles located in the public spaces of campus academic and administrative buildings. The two posters spell out exactly what is recyclable across the paper and mixed plastic/metal/glass categories. They were sorely needed to replace old signs that—in most instances—were removed long ago because they became worn or fell down. The new posters also contain important updates to what can currently be recycled. In the paper category, softcover books such as paperbacks, phone books and notebooks are now recyclable. Plastic recyclables now include No. 5 plastic food containers that are wide-mouthed or tub shaped and typically used for yogurt, margarine, cottage cheese, etc. Anyone wanting copies of the new recycling signs to post in their office or department areas, or to report signs needed for public-area recycling receptacles, should contact the SU Sustainability Division at 443-9820 or sustain@syr.edu. The signs can also be downloaded from http://greenuniversecity.syr.edu/Recycling.html at the SU sustainability website and printed. For more information about campus recycling and sustainability, visit the SU sustainability website, follow @SustainableSU on Twitter and check out the Syracuse University Sustainability Facebook page.